Last September, the newly built elementary schools Het Meervoud and De Houthaven in the Houthaven district in Amsterdam opened its doors to their pupils and staff. As these buildings are connected to the Comfort Cooling network, this means the first part of the first demonstration in Amsterdam is ready! Just as the other parts of this transformation area, this school building is climate neutral, including a sustainable casco. The entire area is developed according to the principles of trias energetica: reduce energy use, use renewables, and if it cannot be avoided, use fossil energy as wisely as possible. For heating a district heating network is fed by the Waste-to-Energy-plant of AEB. For cooling a cooling network is put in place by Westpoort Warmte (WPW), which is fed by cold from the nearby IJ-river. WPW is a joint venture between Nuon Heat and AEB Amsterdam. The high level of insulation of buildings in the Houthaven districts asks for a smart solution to cool in summer. Therefore, cold extracted from the IJ river in wintertime, is put in underground storage. In summertime, when temperatures rise up to 32 degrees on certain days, homes, schools and shops in the area can be cooled to a comfortable level. In late summer this will be done with cold from the underground storage. In early spring, when the surface water is not warmed by the sun yet, the comfort cooling on warmer days can extract its cold directly from the river. The expected CO2 emission reduction of the combination of comfort cooling and district heating is 80% for regular dwellings. Although WPW is hoping to put the system to a real test in its full first summer, first reactions by the school staff, parents and pupils are positive. The school does not only live up to the ‘Frisse scholen’-standard, guaranteeing fresh air inside, but also keeps ‘fresh’ and comfortable temperatures in summer. 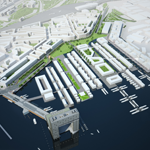 Over the next years all new buildings in the Houthaven area will be connected to the comfort cooling network, the performances of the system will be monitored and the lessons learned will be shared with the City-zen community. The European Commission supports the demonstration of this innovative large scale Comfort Cooling system fed by surface water cold as part of the City-zen FP7 project.